"We are proud to maintain a Green business using all food safe materials." 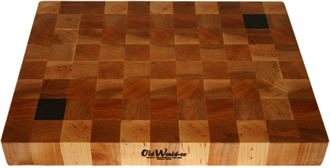 We produce two different styles of surface: The standard edge and the butcher block end grain. The standard edge has our unique profile machined into each board. We add this step for strength and beauty. Precision, art and function, our passion is worthy of your kitchen! Beautiful hand-made rectangular maple cutting boards with our trademark contrasting wood. Identical except for size. 13” x 16” x 1.75” SE-1 Please email for info. 13” x 20” x 1.75” SE-2 Please email for info. Our maple cutting boards are hand crafted and feature walnut accents. These food-grade butcher block boards are available in two sizes. 11” x 14” x 2” EG-1 Please email for info. 14” x 18” x 2” EG-2 Please email for info. For wholesale inquiries or bulk orders, please click here or call 704-662-6000.